Debt should be a good thing - and everyone sees it as such at first. You don’t have enough money to afford a house or a car, so you borrow it. The trouble begins when it turns into bad debt - and there can be severe consequences. The differences between debt and bad debt are relatively easy to understand. Debt is affordable and can improve your life. Bad debt, however, is not affordable. The impact it has can be frightening, stressful, and it can start to take over your life. In today’s guide, we’re going to take a look at some of those vital consequences bad debt can have on your household, family, and lifestyle. And we will also give you some ideas for escaping from this ever-increasing problem. Read on to find out more as we uncover the true - and terrible - consequences of bad debt. First of all, the most obvious impact of bad debt is that your credit report will take a significant hit. Without a decent credit score, you can find it hard to get a mortgage, loan, or credit card. Poor credit ratings can even affect your ability to get credit from a simple store card, or take out a contract on a cellphone. You might struggle to get a plan for your utilities at home, or even rent a home. And it can also have a bearing on your chances of getting a job. More employers than ever are running credit checks before offering candidates jobs. Many people will find it tough to lead a normal lifestyle, just because their credit score is bottoming out. Bad debts come higher interest rates on your loans, credit cards, and everything else you can imagine. As a bad debtor, you are viewed as a riskier borrower than someone with good credit. In simple terms, you end up paying for this risk with a higher interest rate. It means the second you start to spiral into debt problems, you end up paying more. It is critical that you stop this spiral downwards in its tracks to prevent your issues becoming impossible to deal with. Find a nonprofit debt charity or organization to help. Alex Kleyner is the CEO of National Debt Relief. He suggests seeking help from debt relief organizations with A+ ratings from the Better Business Bureau. People with bad debts live in deep fear. When the phone rings or the doorbell goes, their first thought is that a debt collector is waiting to pounce. Letters will fall through the door with alarming regularity - and demands for payment will increase. But when you have no way of paying, the situation just escalates. It is critical that you address these problems as soon as possible. The longer you leave it, the worse your situation will become. And, the more likely your stress levels and anxiety will increase. Often, hiding away and not responding can lead to these feelings intensifying. However, it’s important to understand that being in debt is not illegal. Tackling your debts head on can help you reclaim some control. Once you start chipping away, you will know it will be possible to get there in the end. Stress and anxiety are two of the major issues that debt can have on your health. But these two conditions can also lead to other, more dramatic problems. Stress is known to be a cause of stroke, high blood pressure, and heart disease, for example. People with stress are also more likely to develop stomach problems and ulcers, too. And anxiety can lead to severe mental health conditions surprisingly fast. If you have bad debts and your health is suffering, get help as soon as possible. Your doctor will be able to outline a course of action that you can take. Having bad debts can also lead you to make desperate decisions. When you can’t find the money to pay people back, there is a lot more temptation to steal, for example. You will also be more open to serious problems such as blackmail. People without money will often do anything they can to survive, and it doesn’t take long for it to happen. Given that most Americans are only one paycheck away from financial ruin, it is a grave concern. While your situation might be comfortable right now, how confident can you be that things won’t change? A job loss or serious illness can lead to you dropping into poverty within a few months - and it can be hard to climb back out. Desperate times call for desperate measure, so it’s vital to understand that even a saint can sin when in debt. Bad debts can also cause a lot of problems in your relationships. Again, stress is a significant factor. There will be many moments of conflict, and it’s a highly volatile situation. Any relationship, no matter how close, can undergo a severe amount of strain. Don’t forget, your kids will be affected by bad debts, too. They will be more aware of your financial hardships than you think. And, they could start missing out on things at school, because you just cannot afford them. 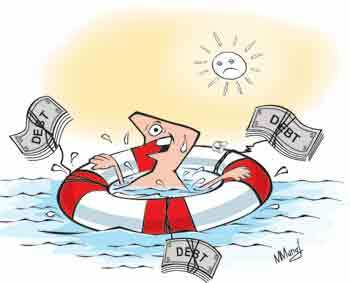 In fact, many children in households with bad debts experience stress themselves. Plus, they are more likely to develop mental health challenges as they get older. Be wary of the strain bad debts can place on your relationship. Get help if you need it, and always try to communicate as well as possible. Finally, your working life can be affected by your household debts, too. With so much pressure on your plate at home, workplace productivity is likely to take a dip. You will have a lot on your mind, from worries about money to fear of debt collection agencies. Ir is also likely you will miss more days off sick than you used to. The result could be many disciplinaries, and perhaps a termination of your contract. If you are experiencing debt problems, it might be worth talking to your employer. Good bosses should make allowances for you, and they might even try to find you more shifts or work to ease your financial burden.